This simple recipe is chock full of flavor with generous chunks of ripe avocado and savory cubed roast chicken. 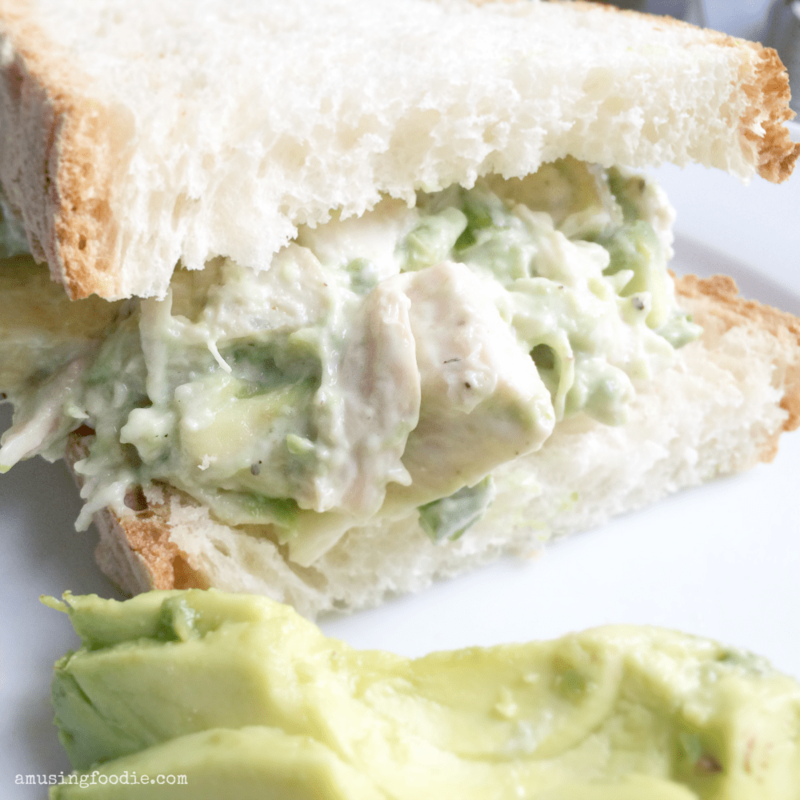 Avocado chicken salad is great eaten on its own, or atop toasted crusty bread to make a hearty, delectable sandwich! The other day I roasted a chicken. It’s not an uncommon occurrence, since one whole roasted chicken can fill a myriad of needs, from chicken stock to lunch leftovers, to framing up a few different dinners through out the week (roast chicken, fajitas, chicken noodle casserole, etc.). Whole roaster chickens are also super inexpensive, with a four-pound bird averaging between six and ten dollars, depending on the brand, store, whether you choose organic, or if it’s from a local farmer. I ended up with a little over a cup’s worth of cubed white and dark meat after using up the rest for dinner, lunches, and as the base for my chicken stock. I also happened to have a few ripe avocados on the counter, that surely in a day would be beyond ripe (or an hour, you know how avocados are, those shifty buggers). So, I decided to whip up a little avocado chicken salad. It was as easy as tossing a few fresh ingredients in a small mixing bowl, folding them together gently with a rubber spatula and then enjoying the avocado chicken salad on its own, or sandwiched between two soft pieces of bread. This recipe made enough for me to enjoy on a sandwich, as well as had enough for leftovers in my daughter’s lunchbox the next day AND for one more on-the-go dinner during a busy weeknight evening. Yum! I love simple things that taste great. This simple recipe is chock full of flavor with generous chunks of ripe avocado, and savory cubed roast chicken. Whisk the mayonnaise, lime juice, onions, salt and pepper together in a mixing bowl. Gently fold in the avocado and chicken until all the pieces are coated. 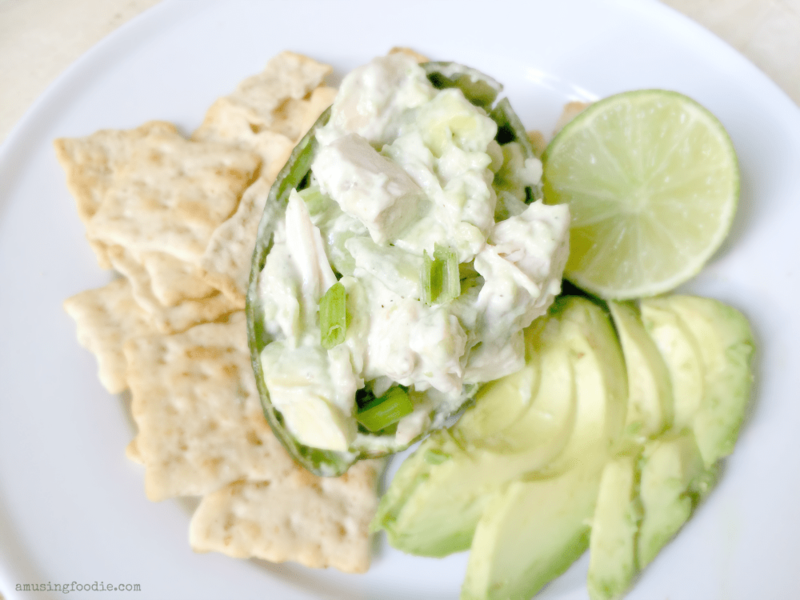 The avocado in any leftover avocado chicken salad may brown a little (the lime juice should help prevent that). If it does, the flavor and freshness won't be affected; it's merely an aesthetic change.